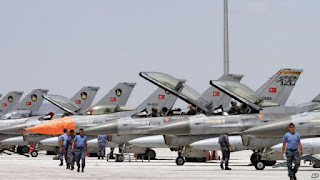 A statement said the strikes focused on the Kurdistan Worker's Party (PKK) in Hakkari province, which borders Iraq and Iran. The airstrikes follow a series of deadly attacks Monday that left four police officers and a soldier dead in neighboring Sirnak province. Overnight, Kurdish rebels attacked a military post in Sirnak, killing a Turkish soldier. Turkey has been bombing PKK targets in southeastern Turkey and northern Iraq since late July after announcing a new anti-terror offensive. Turkish forces are also targeting Islamic State militants across the border in Syria. 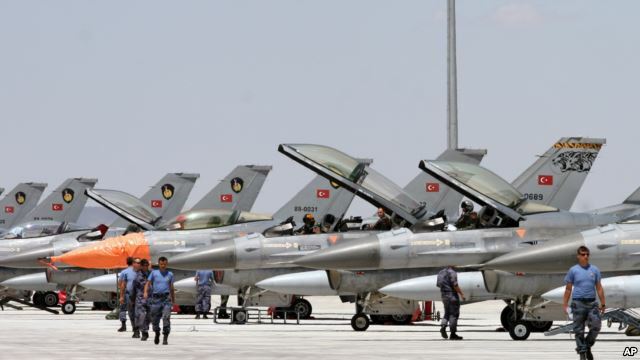 The United States and European Union called on Turkey last week to show restraint in its bombing of the Kurds, saying the country had a right to defend itself but that the response should be "proportionate." The U.S. State Department said the PKK should renounce violence and engage Turkey in talks. The PKK has been fighting Turkey since 1984 in a conflict that has left 40,000 people dead.